Ed Gamboa is a board certified General Surgeon, with specialization in General, Trauma, Venous, and Robotic surgery. 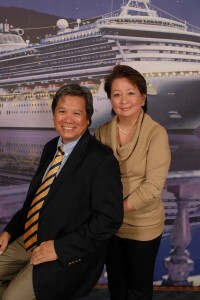 Following his pre-medical studies at Velez College in Cebu City, Philippines, Ed received his basic medical education at the Cebu Institute of Medicine in Ramos (1970-1974). In 1976, four years after the imposition of martial law in the Philippines, Ed moved with his new bride, Dr. Lucie Escano Noel, to the United States and pursued further training in Family Medicine in Yonkers, New York, General Surgery in SUNY-Buffalo, and Pediatric Surgery in Brooklyn. During this same time period, Lucie pursued her own studies, specializing in Pediatrics and Pediatric Nephrology in New York. The couple moved their family to San Diego, California in 1985 where Ed trained in Transplant Surgery at UCSD then practiced at Scripps. Lucie opened a Pediatrics practice in Mira Mesa and La Jolla. Ed served as Chief of Surgery at El Centro Regional Medical Center for many years. Most recently, Ed and Lucie have come to the Monterey Bay Area to be closer to their children who live in the San Francisco Bay Area. Board Certified in Surgery, and a fellow of the American College of Surgeons and the International College of Surgeons, Ed is currently practicing in Watsonville, California. Born and raised in Cebu City, Philippines, Ed loved spending summer weekends at the beaches of Talisay and Mactan as a child, visiting his grandparents in Bantayan, or traveling to other nearby islands of Cebu Province. Going to the movies was another favorite pastime. His love of travel and marine activities remains to this day, with sailing a favorite pastime. Writing is another of Ed’s favorite activities. Author of From Mt. Krizevac to Mt. Carmel: A Medjugorje Pilgrim’s Conversion under the pen-name, John Paul Noel, Ed has also written a weekly column for the Asian Journal in San Diego (asianjournalusa.com) for many years. His second book, Virtuous Healers: Models of Faith in Medicine, was published in 2008 by St. Anthony Messenger Press. Ed is currently working on an historical novel, The Dark Night of Father Madrid, about an activist priest in the Philippines. Ed is a Benedictine oblate of Immaculate Heart of Mary (New Camaldoli) Hermitage in Big Sur and a member of the Knights of Columbus and the Lay Brothers of the Poor. Drs. Ed and Lucie Gamboa founded St. Joe’s Buddies to help organize international medical missions, particularly to Haiti and Jamaica. They are currently working to fund the construction and operation of Santo Niño Clinic in Cebu, Philippines. With his wife Lucie, Ed believes that healthcare is a team effort. Treatment is most effective when patient, family, nursing staff, other physicians and health care practitioners, and the surgeon are on the same page. The common goal is to accomplish what will work best for the patient. To this end, Ed keeps up to date on the most effective new technologies and methods for treating common conditions, including varicose veins and other circulatory system maladies.